Dreaming, believing, and achieving are the steps that line the path to fulfilling our goals & dreams, a path Monica has traveled many times. Her job as Artistic Director & Choreographer at her studio, Monica’s Danz Gym, has realized some of her earliest aspirations in life. Monica has always known she wanted to be a choreographer–as a young girl, she could often be found pirouetting her way around the wooden floors of her family’s living room for hours at a time. Her formal training at the Royal Winnipeg Ballet was second only to her passion for artistic gymnastics, the path she chose to pursue at age twelve. Though she continues to dance as a compliment to her training, Monica’s seven years as a member of the Canadian National Gymnastics Team gave her the opportunity to compete all over the world, from Japan to Russia. Her signature grace & artistic flair was widely known; she truly shone on Floor Exercise, where her most influential teacher & choreographer, Peggy Cook, captured Monica’s finesse in her many floor routines over the years. Peggy opened Monica up to a world of endless possibilities, helping lay the foundation she continues to thrive off of to this day. Family has always played a significant role in Monica’s success. It was her parents who coached her to the top, pushing her to fulfill her full potential as a five-time medalist at the Pan American Games, and a member of the 1980 Olympic Team. Building something from nothing is a passion passed down through the generations–Elfriede & Wolfgang Goermann built the Winnipeg Gymnastics Center up from the ground. Their humble beginnings were found within the walls of the YMCA, where gym time most often meant family time. The first time Monica did her Tsukahara on Vault was a family affair, with her mom spotting in the front, her dad flipping her in the back, and her brother bringing up the rear. It was her father who first suggested Monica establish her own dance studio, after her years of teaching dance to her fellow gymnasts, and her many experiences coaching & learning abroad. Twenty successful years later, Monica’s Danz Gym is thriving under the careful guidance of Monica, with Liz Cooper’s aerial expertise adding the unique element of flight to their repertoire of classes. Monica plays a very active role in her studio’s success–she teaches a variety of classes, from acro danz to aerial, to students of all ages. 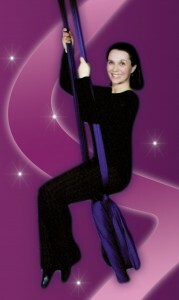 Her most recent endeavor took her on an adventure to Sarasota, FL, where she became an instructor in Flying Aerial Yoga. Striving to pass along the knowledge she has gained on her journey, Monica has given many girls the opportunity to travel overseas to study & perform, throughout much of Europe & North America. In 2003, she and Liz established Winnipeg’s premier youth circus troupe, Momentum Aerial & Acrobatic Troupe, which enables youth to pursue the aerial arts at a high level. Monica strives to open up a world of possibilities to her students, just as she was taught when she was young. The one thing that has remained throughout the years is the strong presence of family in Monica’s endeavors. MDG never would have become the place it is today without the unwavering support of her husband, Michael Thomlinson, also known as Engineer Extraordinaire. And now, just as her mother coached her on her gymnastics journey, Monica has become her own daughter’s coach–it’s a passion that runs through their blood. The dynamic mother-daughter duo will no doubt go far in achieving their dreams. Through teaching her students to embrace the world of endless possibilities, Monica continues to change lives through the art of dance.